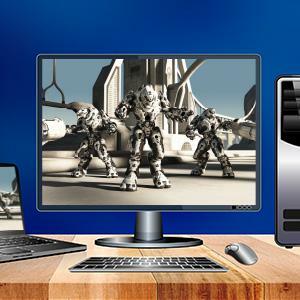 Optimized for multitasking and high-end computing, WD Blue solid state drives offer superior performance with industry-edge reliability. 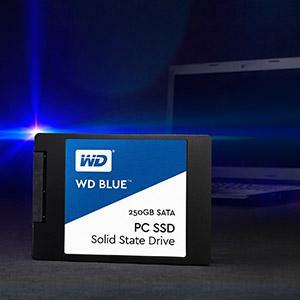 With extensive WD F.I.T Lab compatibility testing, a WD Blue SSD lets you upgrade your digital storage with confidence. Read speeds up to 545MB/s and write speeds up to 525MB/s for blazing fast performance*. An industry-leading 1.75M hours mean time to failure(MTTF) for lasting reliability. Based on internal testing Telcordia stress part testing. Optimized for multitasking and resource-heavy applications. A WD Blue SSD has read speeds of up to 545MB/s and write speeds of up to 525MB/s for faster application response times and boosted transfer speeds. With WD Blue SSDs, you get the speed to easily run high-end applications like video games, HD media players, or creative software. *Read/Write speed performance is based on internal testing using CrystalDiskMark. Performance may vary based on host device. 1 MB = 1,000,000 bytes. With a 1.75M hour mean time to failure (MTTF)1 and an endurance rating of up to 400 terabytes written (TBW)**, WD Blue SSDs are ready to run for years to come. 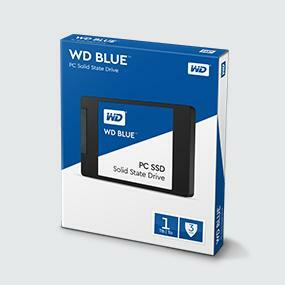 Along with several error-correcting technologies, WD Blue solid state drives protect your data with lasting reliability. **TBW (terabytes written) values calculated using JEDEC client workload (JESD219) and vary by product capacity. Optimized for multitasking, WD Blue SSDs can simultaneously run several resource-heavy applications with ease. 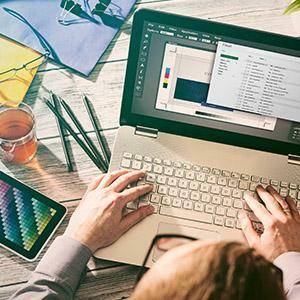 Edit a 4K video, check your email and run a virus scan in the background, all without slowing your system. Available in 2.5” 7mm and M.2 2280 versions, WD Blue SSDs are ready to accommodate most laptop and desktop PC form factors. 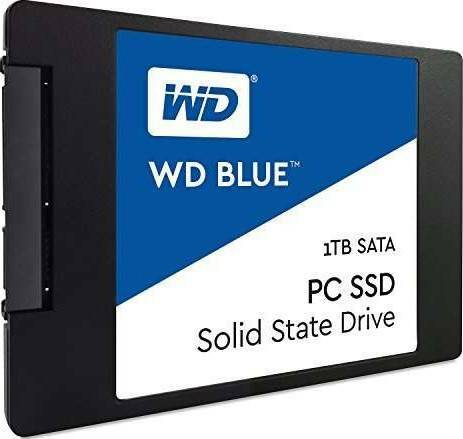 WD Blue SSDs go through extensive compatibility and reliability testing, and are certified by WD FIT Labs to work with a wide range of desktop and laptop computers. 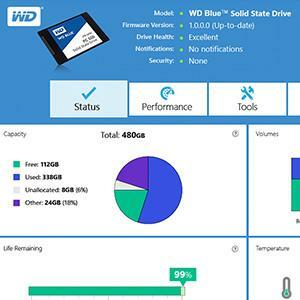 The WD SSD Dashboard gives you a powerful suite of tools to track things like your available capacity, drive health, firmware version, SMART attributes, and more. 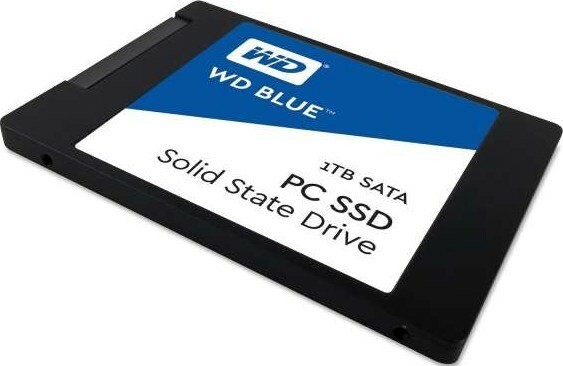 We offer express delivery to Dubai, Abu Dhabi, Al Ain, Sharjah, Ajman, Ras Al Khaimah, Fujairah, Umm Al Quwain, UAE for Western Digital 1TB Blue Internal SSD Solid State Drive - SATA 6Gb/s 2.5 Inch | WDS100T1B0A-00H9H0. We offer the best price for Western Digital 1TB Blue Internal SSD Solid State Drive - SATA 6Gb/s 2.5 Inch | WDS100T1B0A-00H9H0 in Dubai, UAE. Buy now with the best price!